The first time we “returned” from a cruise, we landed in the Chesapeake Bay after a three year jaunt that took us from Galveston, Texas, to Florida and the Bahamas, down the Eastern Caribbean to Trinidad, Venezuela, and Bonaire and up. It was May, the beginning of the summer. We took down sails, wrapped the boom tightly, closed up the boat, and took off. We had a plane to catch (we were helping friends cross the Atlantic on their 56’ Sundeer, Pelican Express) to St. Martin and no place to stash anything we took off the boat if it had even occurred to us to do that in the first place. Almost 15 years went by before we totally emptied the boat out. When we returned from our second cruise, a much shorter trip to the Bahamas and the Dominican Republic, we emptied the whole boat out within a month. Ever since then, we’ve been relatively good about emptying lockers every time we go on board, though it’s astounding what has managed to creep back on board in the past 8 years. Stuff. How did this stuff get here? What should you think about when you’re leaving the boat for an extended period of time? What do you have to worry about? The specific remedies will look slightly different depending on whether you leave the boat in or out of the water, but the worries are generally the same. There are 3 main categories of worries, plus one more. Whether human or critter, unexpected visitors can ruin a boat storage experiment in dramatic fashion. You need to spend some time visitor-proofing the boat. 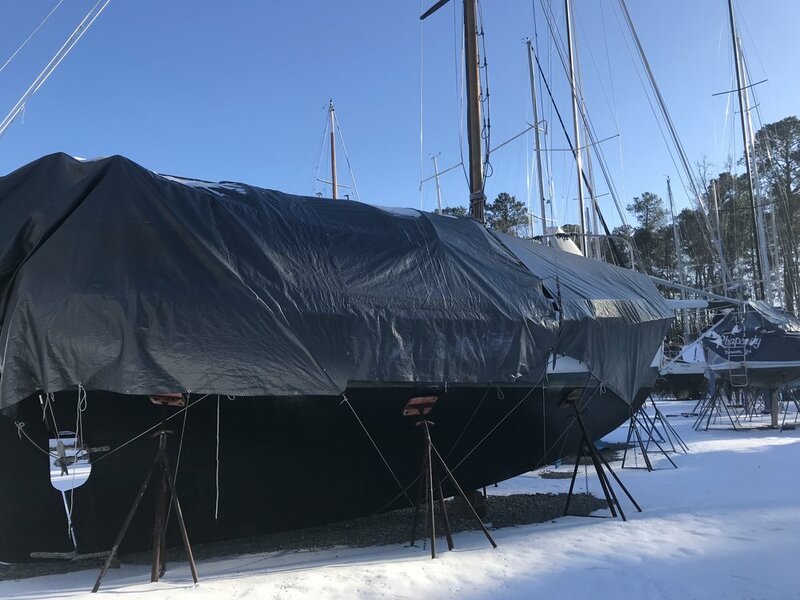 This runs the gamut from locking hatches and the companionway to stuffing the thru-hulls (if you’re hauled out) to guard against bugs and ants finding their way into your home. Bugs and other animals are attracted to the smell of food. Making sure any spills are wiped up, any food thrown away (and the trash completely emptied), and there are no leaks in any food locker can be a really helpful step in minimizing the critter invasion potential. I’d also suggest leaving ant and roach traps in a number of places around the boat, to take care of any that come aboard. Bees, wasps, and birds love to make nests in the folds of sails and even in the end of the boom. Removing sails is a good idea for worry #2; stuffing the end of the boom with small towels can prevent unwanted tenants from setting up house. Some visitors are invited. They are also messy. Thunderstorms, snowstorms, hurricanes – these are all worries that are valid depending on the time of year you’re leaving the boat. Prepare your boat as if the weather were coming. Strip the sails. Remove wind-vulnerable items from the deck and store them below. Make sure your canvas is well-lashed down. This is particularly important if you’ll be far away from the boat during hurricane season, but squalls and nasty winds can come up any time, any where. Check docklines for chafe and double up. Think also about the effect of sunshine on the same place on the boat. Unlike being at anchor, a boat at a dock or on the hard does not swing shift its orientation, and UV exposure can be intense. Curtains inside can save the cushions from uneven fading. There are three kinds of moisture to give you night terrors. There’s mold or mildew, rust, and the rain. The last can cause either of the other 2, and is perhaps the hardest (and also easiest) to deal with! Track down any leaks and fix them. Are you laughing out loud yet? Or, better yet, “Track down all KNOWN leaks and fix them.” This is an exercise in patience and continued vigilance, because leaks can start somewhere and manifest themselves somewhere else. That leaking port light can have drips plonking onto the other end of the settee; we've had a persistent stanchion leak that shows up way back in the galley. You need to track down the source and take care of it there. After you’ve done this to the best of your ability, then go to the next level. Mildew and mold love closed-in spaces with no air circulation. A few fans strategically placed can help with this. A dehumidifier (well-plumbed to a sink to drain) can help with this. Air conditioning can help with this. If you can’t leave the boat plugged into shore power, all of these are lovely in theory but totally not helpful in reality. Open all cabinet doors, wipe down all surfaces with your favorite cleaner (I love clove or lemon oil in water; others swear by Concrobium), and leave them open. Pick up cushions and prop them up to let air circulate under them. If you have solar vent fans, leave them running. Empty the refrigerator COMPLETELY and wipe it down, then leave it open. As far as the unexpected everything else goes, you’ll just have to do your best. Make sure shore power connections are secure and the wires are not frayed. Make sure the docklines are set, the anchor or mooring is seriously well adhered to the bottom. Check scuppers and make sure the bilge pumps are operating and not clogged. You may choose to hire a person to check on the boat regularly. You may choose to hope the marina calls you in the case of something going drastically wrong – in any case, letting them know you’ll be away for a given amount of time is a good idea. These days you can get apps and set up video monitoring systems that let you keep track of your floating home from afar. The one huge area that is truly a matter of personal choice (and where you’ll be hauling out and when) is what food to take off the boat. Yes, taking anything perishable off is a given (or it should be), but what about all the pasta, rice, canned goods? Personally, I’d work to get most of the non-canned items eaten or off. Pasta and rice will mildew (which is as gross as it sounds) and attract bugs. Canned items are a matter of preference; soda cans or other thin aluminum cans will develop pinholes and leak, so I would not leave anything like that on the boat for more than a month or two. Canned food in general is processed at super high heat (121 degrees F) but the USDA recommends NOT storing food above 100 degrees. If your location is in an area where temps regularly hit that point outside (meaning the inside of the boat will be far higher), then to be safe it’d be ideal to remove all the food on the boat. Start eating! Cruising is about being flexible and taking advantage of opportunities that come your way, including being able to get off the boat. Taking steps before you go can make coming back to your floating home easy and not fraught with unexpected work. Safe travels!